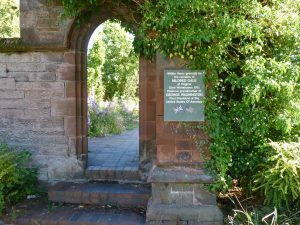 The sea port of Whitehaven in Cumbria, England is home to the final resting place of Mildred Gale of Virginia, the paternal grandmother of George Washington, First President of the United States Of America. For United States of America visitors in the English Lake District in particular, we can organise half a day of your itinerary to include a trip to the town. A few hours well spent here will allow you to see for yourself some history of the first president and Founding Father. Mildred Gale resting place Whitehaven. Photo by Best Places Travel. Whitehaven has another connection to American independence and it’s foundation. 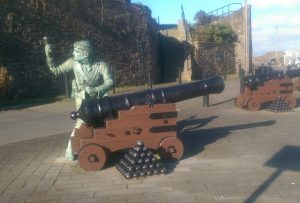 The only mainland American invasion of Britain occurred at Whitehaven in the early hours of 23rd April 1778. 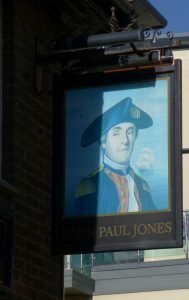 John Paul Jones, a Scots born sailor who was apprenticed in the town, led men of the Continental Navy ashore and spiked the harbour’s defensive guns before making his getaway. John Paul Jones is regarded as a founder of the American Navy, his remains are interred in a crypt in the U.S. Naval Academy Chapel at Annapolis, Maryland. 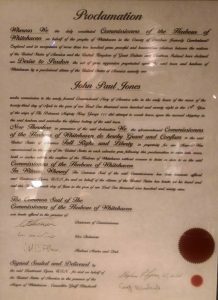 As a ceremony witnessed by representatives of the US Navy on 27th June 1999, Jones was pardoned by the Commissioners of the Harbour of Whitehaven, on behalf of the people of the town.